You may download the full lesson quarterly from Amazon in Kindle format. 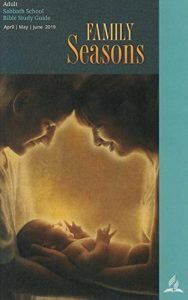 Lesson authors Claudio Consuegra and Pamela Consuegra also wrote the companion book on the same topic, Family Seasons, in the Bible Bookshelf series, which is available in Kindle format. (While you are at Amazon, you may want to try Amazon Prime 30-Day Free Trial and get free 2-day shipping on most items plus other benefits.) You can also order the paper lesson in various formats from your Adventist Book Center (Call 1-800-765-6955). All of our Amazon links now work for Canada, the US and Great Britain. Try them! You can join other Sabbath School students to study your lesson daily on our blog and exchange ideas with others from around the world on the topic of the current lesson study. You may order a print or Audio copy of this Bible Study Guide online at the Adventist Book Center. The lesson organization in English provided at this web site is quoted directly from the lessons prepared by the Office of the Adult Bible Study Guide, General Conference of Seventh-day Adventists), and is used here by permission. You may contact the editors of the Adult Bible study guide by going to this page. The iPhone and Android app produced by the Sabbath School and Personal Ministries department of the General Conference of Seventh-day Adventists gives you access to print content from Beginner through the Adult Bible Study Guide. The app is simply called “Sabbath School.” It provides links to all lessons in PDF format, which are downloaded when you click on them. Also included are the Adult, Kindergarten and Primary audio podcasts, the Kindergarten animation podcast, the weekly reading of the Collegiate Quarterly, Sabbath School University video, Sabbath School University audio, and podcasts in various languages. Sabbath School Leaders can discover ideas in Cool Tools and access the Sabbath School Manual right from the app.The app is available for free in the Android app store. It is also available at the iTunes app store. Apple may charge a small fee for access. The Sabbath School Quarterly app for androids features the complete Adult Bible Study Guide, with links to a companion Bible app, and it includes sections for notes that are saved till needed in Sabbath School discussions. On your Android device, just go to Market and search for “Sabbath School Quarterly.” It’s a free app in the Books & Reference section. All it lacks is online discussion. For that you have to come back to Sabbath School Net. Ecole Sabbath android app is the French Sabbath School lesson and podcast. Don’t have a Kindle reader? You can download the Amazon.com free reader for the PC, or the FREE app for mobile devices here. You get your own genuine Kindle reader here, starting at US$ 79.99. You may find that you enjoy the freedom to size the print to your liking and reading in bed without needing a light to shine on your paper book. From Here to There: The incredible journey of the Adult Bible Study Guide – the fascinating story of the production of the Adult Bible Study Guide, where it travels, and what happens to some of the copies. Download the Sabbath School Handbook in PDf format -This is a very useful resource for Sabbath School Superintendents and all division leaders. Find Adult Sabbath School Bible Study Guides in other languages. Please note that we do not write or edit any of the Study Guides for any age group. You can click on the link to contact the editors of the Adult Bible Study Guide. For the editors of other lessons, please go to the appropriate site. Any comments made here, but addressing another site, will be deleted. We do not send out paper copies of anything. This is an internet ministry. Everything we offer is found on this site. Please explore the site before asking questions. If you still have questions after searching this site, you may contact us through the link under “About Us” in the menu. If you wish to comment on a lesson, you may do so under the appropriate lesson post. Check out our Links section for free Bible studies online or by mail. thank much for ur concerning am always visit your website but my request in that lesson are always available in english and ather language but there are people from east african countries who wishes to read the lesson through internet but they dont english it si our request the kiswahili copy to be available in website so aspeople from east africa can understand the word of God. THANK MUCH MAY GOD BLESS YOU. can you please send the lesson weekly? We do not send out lessons weekly. You can access our weekly lessons by going to our front page and clicking on one of the options above and below the lesson cover at the top of the left sidebar. We do send out daily lessons. To receive these by email, you need to subscribe yourself to one of our email distribution lists. To do so, go to our front page and click on "Discuss." Underneath, you will see a drop-down menu, which includes "Posts by Email." Click on that and choose the appropriate option. For the Daily Lessons, choose the option for your area of the world. If at some time you should want to unsubscribe, use the link at the bottom of one of the posts you received. The short answer is that there is no single "best bible version to study." If at all possible, it is best to consult several different versions to get an idea of what translations are possible from the original text. The bottom line is probably that the best Bible version for you is one you will actually read. The "best bible version" that mainly sits on the shelf is not nearly as good as a "lesser" version that you read. And most important of all is to ask the Holy Spirit to interpret the Bible to you. He inspired the Bible in the first place, and He can and will make it as clear to you as necessary. Amen.... I really agree with answer given above, thank you. We must not merely listened to the word and deceive ourselves, we have to do what it says. Anyone who listen to the word but does not do what it says is like a man who looks at his face in a mirror & after looking at his face goes away and immediately forgets what he looks like. Versions of the Bible ARE significant. Words, phrases and punctuation all have meaning and can change meaning in a text. You should consider utilizing the King James Version of the Bible as your authoritative version of the Bible. Happy Sabbath! You need to do a little more serious study on how the KJV (AV 1611)came to be and the documentary evidence concerning it's absolute accuracy. Papyri going back as far as around 90 A.D agree totally. There is a great deal more evidence to prove it's genuineness and accuracy than I can list here. Nonetheless, any reliable translation is good for reading and casual study. Doctrinal studies and word studies should stay with the KJV (AV 1611). Take note that some KJV editions have been edited by one group or another and may contain word or phrase changes. Most put those changes in parenthesis. I have done the serious study and a brief summary of that is found in the article I have written. I marvel at its accuracy but at the same time I am aware that certain phrases and expressions were deliberately used to support the Church of England. That bias is well documented. That does not detract from the translation but it is worth bearing in mind. Furthermore the KJV that we currently use is the 1769 revision and not the 1611 original. This is also documented in the article that I wrote. I agree with J Taylor. Be sure when reading a newer version be sure it agrees with the KJV. Even one little word can change the meaning of the verse, like the article ‘a’ or ‘the’. Believe me, it does happen. The KJV like any other translation was published with an agenda in mind. We need to understand this. Furthermore, the use of definite and indefinite articles in the English language is not directly related to the original, particularly in Hebrew. In ancient Hebrew, there was no indefinite article and the definite article had a different intention to the English usage. Translation is much more than just word conversion. Thanks a lot Brethren for the lessons. we are growing rich with the word of our God every day as we study. let all churches both local look for a formula of studying our lessons as we do not read and finish on time. let us be good steward of time. Samuel, I would like to suggest a more helpful approach than going through the lesson, page by page. 1) Once, with the question, "What does God want to say to me in this lesson?" 2) What is the most important point in this lesson for my Sabbath School Class? What is the main theme? 3) Study with the idea of coming up with good questions to allow the class to conclude what the teacher concluded in (2). If teachers follow this format, they will always be able "cover" the most important points in the lesson for their classes. They can arrange their lesson outline in the order of most important to "also important" and "helpful," followed by a summary of the most important points just before closing. And as Sabbath School "students," please appreciate a teacher doing serious preparation and not following the lesson outline day by day. Thanks for your help to identify the best sabbath school teachers, just to add lets avoid these types of words when share the lessons: i do not agreed with him or her, i want to contradicte what he or she said,or i want to support what the AB said contrary to what C said. Could I have The Sabbath Adult School lesson like this? That is: Recorded separately one day-lesson at the time, and so on. Thanks and God bless all of you. Look for the Daily Lesson portions on our Audio, Video & Braille page. The lesson is helpful, it helps u walk in the lord's on a daily basis the only challange the we face in our local church is the way teachers are nominated. What are the best way of mominatimg teachers? Should there be any criteria? Thank you very much for this useful site. Is it possible to get the lesson in Powerpoint? Currently we do not know of anyone producing the lesson in PowerPoint, but that doesn't mean that no one does. If anyone would like to offer a PowerPoint version, they can let us know. I wanted to know if there is a site you can recommend where people around the world participate in the weekly lesson discussion online so that i can gather a wider range of views. I am a lesson teacher and i like taking a practical approach in my teaching as it makes a greater impact to my class as opposed to just reading the written text. If you'll go to our front page or to the Daily Lesson page, you'll see comments from people all over the world. I suggest you consult our Frequently Asked Questions page if you need a little help understanding our site. Thank Anderson you for the guidance. At first, I was just rushing through the page as i was working with several windows on the same. I have taken time to view through the comments and am finding very useful contributions on this weeks lesson. Thank you again and God bless you. If you will check our front page, you will see that we already feature one video every week, and there are more in our Audio-visual section. May the Lord bless you as you use the weekly lessons as an aid to getting to know Christ better through the study of His Word. Thank you all for the wonderful comments. One asked which is the best bible version? To all that are reading this comment, experience has shown that if you are SDA don't go out on a bible study without KJV as your standard reference bible, if not the NKJV. You can use the other translations to compare but don't forget the KJV lest you be amazed when you are stuck and have no where to turn to and are bombarded with questions and you discover the version you have has some verses not included. Happy sabbath. Stephen, the texts "left out" in reliable modern versions are the ones not found in the most respected ancient documents. It is best to leave out questionable texts when we give Bible studies, no matter which Bible version we use. All our doctrines can be demonstrated from nearly any translation of the Bible, including the "New World" translation (Jehovah's Witness). We need to remember that the KJV is available only to English speakers, and God has people in all language groups of the world, not just the English-speaking world. The KJV is a beautiful translation, and that's one of the reasons many of us love it. (I have memorized a lot of texts out of the KJV.) And there's reason for its beauty - the translators were charged with creating a translation with beauty of language. When they had a choice of how to translate a text (and those choices do happen in translation), they chose beauty of language over accuracy. That said, the KJV is still a good translation for the many people who love it. But we should not insist on using only the KJV because it presents a real hurdle to younger people we want to reach with the gospel - the hurdle of learning a new language, since the KJV is not written in the language of today. The writings of Ellen White are a blessing for those who believe and are not intended to be used to persuade others to believe as we do. That said, however, some of her writings are quite suitable to share with those who do not believe as we do - books like Christ's Object Lessons, Thoughts from the Mount of Blessings, Steps to Christ and every book of the Conflict of the Ages series. We need to pray for wisdom to match the literature to the needs of people we meet, remembering it is not our job to convict, but only to share. I appreciate the way you say, "it is not our job to convict, but only to share." This stands in contrast to what I've heard some say, who I'm sure are well meaning, that "we ought not push some subjects on people; the Holy Spirit will teach them." (These comments usually come up in the context of discussing Christian standards.) May God give us all eyes to see the opportunities that we have for sharing, with the words to express His will in attractive ways. There is this Adult lesson study guide titled Daniel, a 2004 fourth quarter study guide. Well, I easily got it on internet but I'm looking for that study guide in KOREAN language. I'm currently living in Korea. We're happy to hear that you enjoy studying the Bible. The object of Bible study is to get to know Jesus better, and if you ask Him to speak to you through His Word at the beginning of your study, He will speak to you. As for where there are preaching opportunities, I gather you mean other than in your community. If so, I suggest you contact ShareHim.org. The best place to practice preaching is in your home church. 🙂 You will learn as you practice and ask the Holy Spirit to give you wisdom. "Hermeneutics" is about interpreting the message of the Bible. Usually people go to college and the seminary to study under that big word, but the Holy Spirit is quite willing to interpret His Word to anyone who asks. So ask that the Spirit will speak to you as you read and study. It's no good preaching to others what you have not experienced yourself. If you want a little taste of biblical hermeneutics, you can go to Biblical Hermeneutics: The Interpretation of Scripture on our site and study through the material referenced there. If you want to download the lesson in PDF format, look further up on the page for "Current Adult Bible Study Guides in PDF format." You will have to download these one lesson at a time. For the HTML lessons, see the link on the left to the topic of the quarter. I am having a lecturer that is an atheist I would like to get some innovative ways I can reach him.Any Ideas out there saints?Thank you.Love you and God bless. I have had many Atheist lecturers in my career, and have developed strong friendships with some of them. My best advice is that if you live your life as a Christian should, sooner or later lecturers who have become your friends will ask you questions about your lifestyle and beliefs. There are a few things to keep in mind. 1) Show respect for the beliefs of others. Many of my atheistic friends have thought long and hard about what they believe and come by their beliefs quite honestly. Telling them that their beliefs are wrong and that you have the truth is a fairly sure fire way to end any discussion of spiritual values. If you show them respect for what they believe, they will show you respect. 2) Atheists speak a different language. It is no use using christian "terminology" to explain what you believe as the vocabulary you would use is like a foreign language to them. You will need to be quite innovative in thinking of ways to communicate your ideas to them. 3) Spend more time listening than talking. My PhD supervisor had relationship issues. At our weekly research meetings I would often spend as much time listening to him unburden himself about the issues with his wife, and later, girlfriend, as we did discussing research. He appreciated the fact that I would listen and not lecture him on what he should or should not be doing. 4) At the end of the day, how you act is always going to speak much more than what you say. my name is nangana from zambia , im also requesting for the study guide pdf to my email. may our good lord continue blessing you all. We do not mail out PDF files. You will have to download them from the link above. You can have daily lessons emailed to you from http://ssnet.org/email-lists/feed-options-email/. You can always access the lessons directly on our site in browser format. I enjoy these lessons but i also need the Bible class lessons for my fiance who is about to be baptised. How do i get them? I would like to know what does this quarter Sabbath school book's cover page paining mean. All i could understand was it a the pic of Job. Nothing more to it. Can someone help me. What was the artiest real trying to express by that cover picture. Every cover I paint is, of course, a reflection of that quarter's content, Ben. Some covers are more symbolic, some more interpretive, and some are simply representative of the lessons. In the case of The Book of Job cover, I have painted a close up of Job's face showing the boils that tormented him, illustrating the bewilderment he felt at the horrors that He believed God had inflicted on him in such quick succession. Job's eyes show him pondering what has happened, and trying to understand why God has allowed it. The body language of his three friends illustrates that they are concerned, but are puzzled as well, initially unsure themselves why their friend seems to be cursed of God. 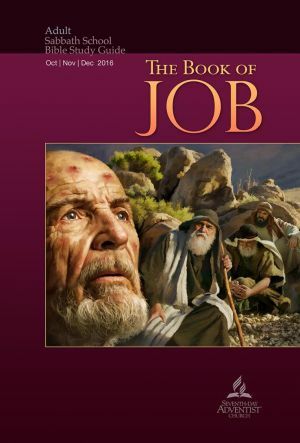 The Book of Job is one of the most plainly written answers to the basic questions of life and suffering that we have in Scripture. It gives us a very straight forward revelation of Satan, the battle between good and evil, and the invisible world that we are connected to. Our existential questions are answered directly. And I like that. The Daily Lessons are published on our site every day right on the home page. You can also have the lessons sent to you by subscribing on the Email Options page. We do not manually subscribe or unsubscribe anyone. You need to do that yourself. I want to thank the Lord for the good work pursued and may He bless thee. It is in this vain that I would love to know whether I can access a soft-copy of a "bible study guide". If yes, I humbly need to be helped. I think you mean a paper copy of the Bible Study Guide? Wherever it is, we suggest you find the nearest Seventh-day Adventist Church and ask there. thank you for the opportunity to be able to read all the comments, question and answer segments there really help me to understand and at the same time relate with others what the Word of God is saying to me through youll. Peter, we would love to have you join the conversation around the daily lesson segments. You can find this by going to http://ssnet.org/daily-lessons/. You will find the most recent lesson at the top, and previous daily lessons below that. like to free downlaod the lesson for 4th Quarter 2017. Why the Adult Sabbath School Bible Study Guide didn't go over Obadiah and Nahum, when it went over Minor Prophets in the 2013 April-May-June Bible Study Guide? In fact, during different quarters from 1986 to 2003, Minor Prophets were covered in the Bible Study Guides before, but Obadiah and Nahum were not covered then either. Why? I would like to download full lesson for this first quarter 2019. Yes, you have come to the right place. If you look near the top of this page you will find a link to Amazon.com where you can buy the electronic version of the lesson. It is in Kindle format but you can get a free Kindle app for just about any computer/phone/tablet available. The cost of the Kindle version of the Lesson is usually about $4 but it depends on which currency you are using.